More and more parents in Jakarta now realised that introducing books to their children in the early age is very essential. This became more important if they want to enroll their kids to preschool Jakarta. With the early introduction to books, the children will be ready when they are given with some reading materials. The best age for children to start learning how to read is between 3-7 years old, depends on their readiness. Teaching your kids how to read could be an overwhelming task if you do not know how to do it right. Here are some effective tips on how to teach your preschoolers how to read. One of the effective ways to introduce reading to preschoolers is by reading books to them. You can start with reading bedtime stories to your kids every night before bed. You can use different voices for different characters to show excitement. Run your finger under the words so they can see the print that represents the story. When they ask questions, stop your reading and discuss their opinions. 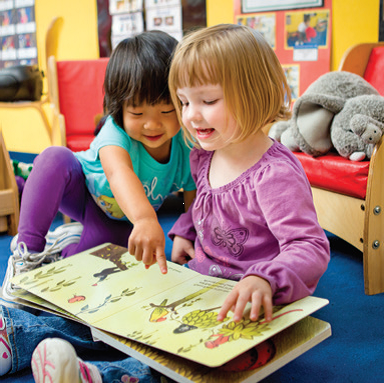 Another way to introduce books to your preschooler is by reading together. Ask them to repeat the phrases after you as you point the sentence in the book. Keep this activity as a routine even if your preschoolers have learnt to read. It will become a habit to them as they learn and understand difficult stories. Another way to keep your kids interest in reading is by interacting with them throughout the reading. Let them predict the possible ending of the story or what happens in the story after certain event took place. By doing this, they will learn the semantic skill which is one of the most important aspects in teaching the kids to read. After reading session at their preschool Jakarta , you can ask your kids to retell the story to you. Encourage them to give some opinions about the story and discuss it together. This activity would keep their interest to read another book to discuss later. This activity also great to stimulate their analytical thinking. Reading material is better introduced to children in very young age. It is rather fortunate that they will learn more about basic reading skills when they enroll preschool Jakarta.